There is no better way to begin a vacation in England than with baboons jumping all over your car! Well, maybe there is, but we decided that going to Knowsley Safari Park would be a fun way to start our trip and it definitely delivered. We saw lions, baboons, owls, camels and so much more. It was a day I will never forget, and I think my 5-year-old would agree! On our recent trip to Knowsley Safari Park we were a bit hesitant to go through the baboon area. They have a reputation for being a bit wild sometimes, and can even tear off windshield wipers or other parts of your car (not good!!!) However, the baboons were by far, one of our favorite experiences of the day. Most of the baboons were just sitting around their habitat, but others wanted to play. You could have 4 or 5 of them on your car at one time, and some of them didn't want to let go. We had one perched up on our rearview mirror for quite a while and he was quite content just sitting there while we drove around. For any Knowsley Safari Park visitors who want to play it safe, there is a 'safe' route for you to take if you don't want baboons climbing all over your car and potentially ripping it apart. Or, you could hop a ride in the the "Baboon Bus" which is a 16 seat minibus that you departs from the information centre. One of the things I really enjoyed was seeing the animals without any immense fences in front of them. Any zoo would have to take precautionary safety measures and put a barrier between you and the animals. At Knowsley Safari Park, you are in your car, which is strong enough to make you feel safe, but also adds an element of adventure to your visit, because there are no barriers or fences between you and the animals. We ended our day with the Sea Lion show which gives everyone the chance to meet some incredibly talented California Seas Lions. Take a look at this video to see their remarkable skills. 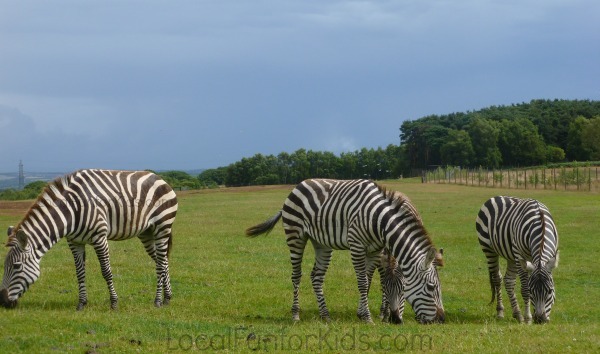 Have you ever been to Knowsley Safari Park? Where is your favorite place to get up close and personal with nature and animals?